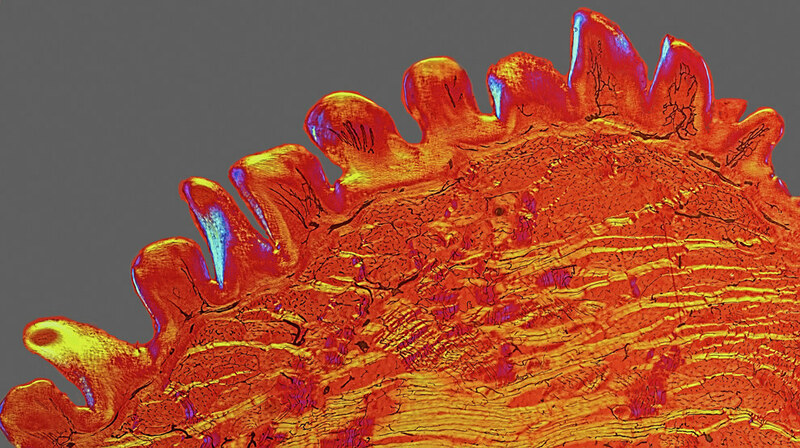 This is what a cat’s tongue looks like when you zoom in on a cross section and add fancy colouring. This photo was a winner in the Wellcome Image Awards 2015. It’s a vintage slide showing a 3mm wide cross-section of a cat’s tongue that was prepared in the Victorian era. The black lines are blood vessels that have been injected with black dye so they’re more easily visible. But if you want to know why your cat’s tongue feels so rough when it helpfully tries to groom you, pay attention to the bumps at the top. They’re called papillae and they basically act like a hairbrush when the cat cleans itself. The roughness also helps cats pick up and hold food. This is what papillae look like IRL.